This cake was designed for my 16-year old niece who loves to wear belts and show off her skin just at the waist. For this cake, I baked two 9x13 cakes (three cake mix boxes), resulting in two layers. I cut the short sides off at an angle so that the waist would be narrow. Using Buttercream frosting, I tinted enough to have "skin" for the hipster and frosted about an inch from the top and down the sides to the bottom of the top layer. 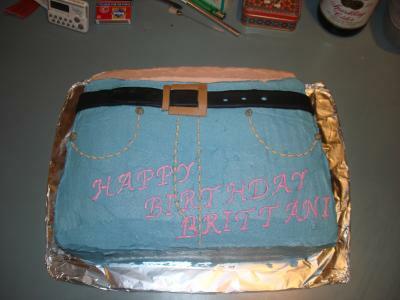 Then I tinted enough icing to cover the rest of the cake with the "denim" blue. I used the giant Wilton frosting tip to go over the "skin" so that I didn't have to spread the frosting and risk mixing the two colors together. The stitches were made with a tip 1 and the "snaps" were made with a tip 5. The wording was easy using the Wilton alphabet set. The belt was made using Wilton's pre-colored black fondant. I used an eyelet tool from my scrapbooking supplies to punch out the holes in the belt. The belt buckle was done using pre-colored fondant as well. This was a great idea for fitting the cake to the birthday person. Thanks for the detailed description also! Great job!